The Amaryllis Belladonna belongs to the Amaryllidaceae family, is native to South Africa, and grows in tropical and subtropical areas (USDA zones 10-11). 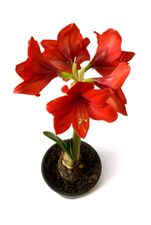 Amaryllis plants grow from 12 to 24 inches tall. Bulbs typically produce 2 to 3 flowering stalks. Their leaves are strap-shaped, 1 ½ inches wide, eighteen inches long and dark green in color. Their large, trumpet-shaped flowers range in color from elegant white to scarlet red. Some varieties produce blooms with an exotic, striped appearance. Potted Amaryllis bulbs are a popular holiday gift and houseplant because they are inexpensive, easy to grow indoors, and are available in a variety of colors, shapes, and sizes. You can buy Amaryllis bulbs from online or mail order bulb suppliers, or at your local nursery or garden center. They are available in pre-packaged kits (ideal for gift-giving), or you can purchase individual bulbs. Flowers are available in a variety of sizes and exotic colors, such as bold red, elegant white, and exotic pink. Choose a sturdy container; flower stalks will get top heavy when flowers are in bloom. As an additional precaution, you can add a layer of small rocks or gravel to the bottom of the pot to add extra weight. The pot should allow for a space of approximately 2 to three inches between the bulb and the side of the pot. If you haven’t already, cover the drainage hole in the bottom of the pot with pebbles, gravel, or pieces of broken pottery. This will allow for adequate drainage when watering the bulb. Fill the pot with several inches of potting soil. If you’d like you can use two parts packaged potting soil, one part perlite, and add one tablespoon of slow-release fertilizer. Place the bulb in the center of the container. Gently press the soil around the roots and bottom of the bulb. Fill the container with potting soil (or prepared mixture) allowing ½ to 1/3 of the amaryllis bulb to remain above the soil. Water the soil thoroughly after planting the bulb. Water should run through the drainage hole. Place the newly potted bulb in a bright, cool room (55-65° F). Water when the top of the soil feels dry to the touch. Over-watering can cause the bulb to rot. When the bulb begins to sprout, move the pot to a location that receives a minimum of six hours of direct sunlight, and maintains a temperature of 68 to 77° F.
Use a bamboo stake and raffia to support the flower stalk if it appears to be top heavy as Amaryllis flowers bloom. Once flowers bloom fully, move the pot to a location that receives bright, indirect light. Note: Amaryllis Belladonna flowers will begin to bloom in about 7 – 10 weeks. Blooms will last approximately two weeks. Remove flowers when blooms wither. Use a sharp razor blade or knife. Only cut off the flower, not the stalk or foliage. As the stalk turns yellow, cut it off at the tip of the bulb. Do not touch the leaves or bulb. Place pot in a sunny location. Feed and water as needed. A houseplant fertilizer at half the strength every two weeks should be sufficient. As bulb grows, repot if necessary. The pot can be moved outdoors to a sunny location during the summer months. Keep soil moist, but not soggy. Continue to fertilize the bulb through the beginning of August. If you live in a location prone to frost, bring the pot indoors and place in a sunny location. Remember to keep the soil moist. Blooms may begin to appear as early as January, or as late as March. 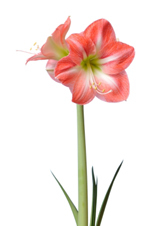 After the Amaryllis bulb flowers, place in a sunny window, or it can be placed outdoors again. Note: Amaryllis Belladonna can be propagated from “mini bulbs” that are off-sets from the “mother bulb”. This process could take up to 2-3 years.